Everyone know WordPress is free, simple and open source blogging tool based on PHP and mySQL.Now a days it become best choice of blogger for its ease of installation and few steps to complete setup. 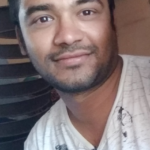 For beginner they should start working from local host environment first then move to deploy on server so they can understand basic concept and can also do some hit and trial work.Even expert can do some experiment like new plugin, new style , new theme and many more task on local machine then apply same on real blog. You can go through WordPress beginner guide to understand how to work on WordPress. 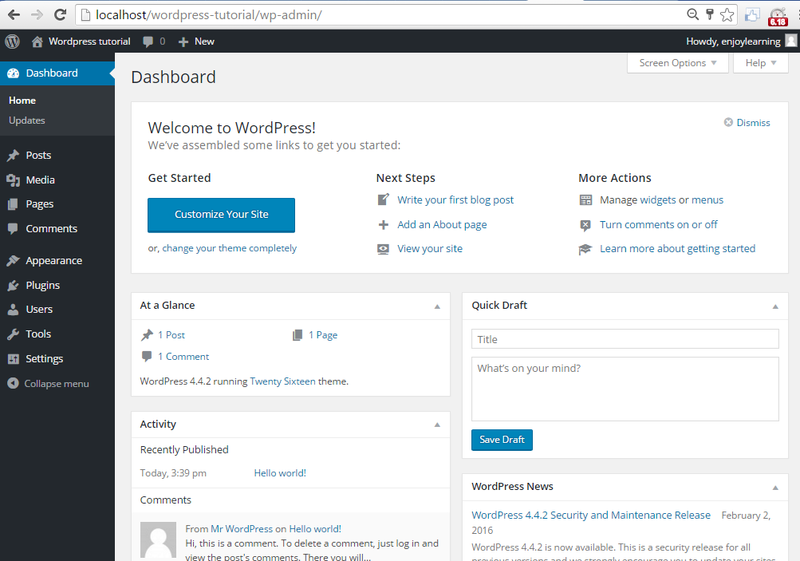 So let’s learn how to use install WordPress on local. 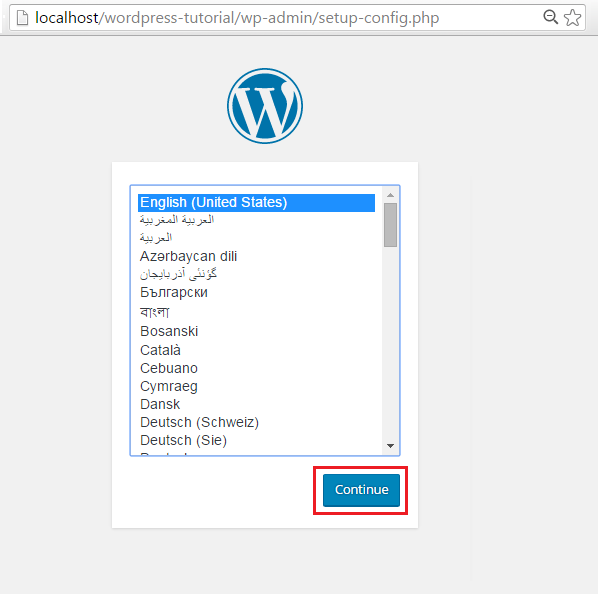 To start install WordPress locally first you need Server on local machine to install WordPress (like WAMP or XAMP). 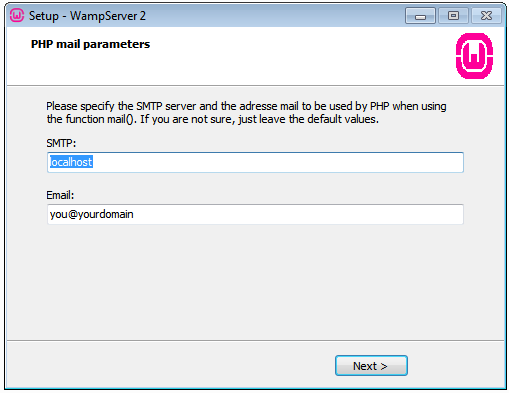 Note:-Here we are using WAMP for tutorial. So question comes in mind why WAMP? 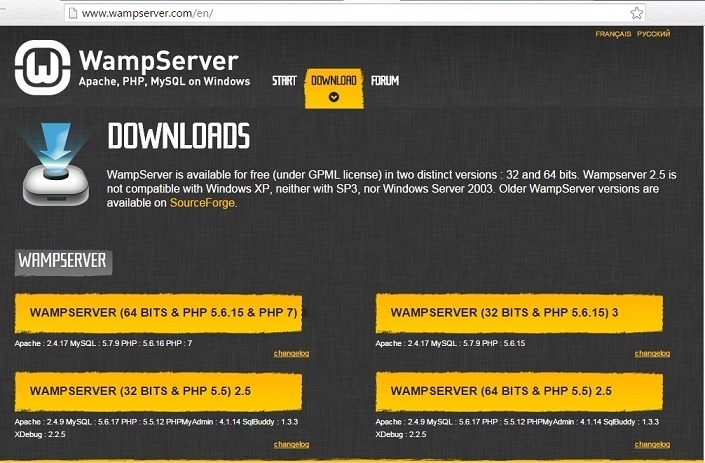 WAMP is compilation of Apache server, MySQL and PHP , that makes server environment at local machine. and best part is it’s free of cost and very easy to use.How to install WAMP? 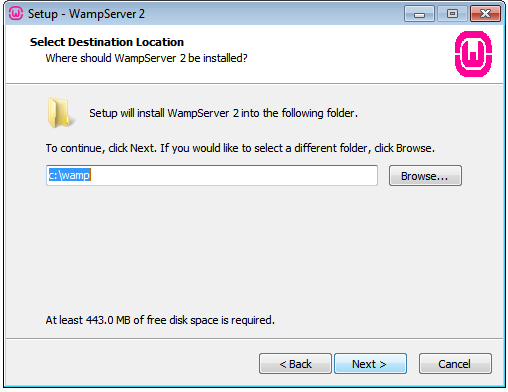 In order to install WAMP you first need to download WAMP server from website so open WAMP server website and click on download tab then select whichever server appropriate for your computer configuration. 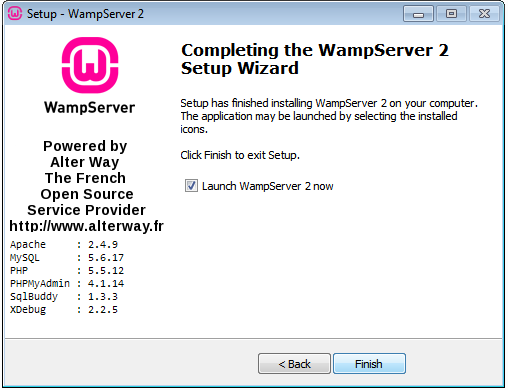 As per my configuration I am selecting WAMP server 62 bit version. Once you select version then you will get pop up so tap on link download directly . Once you tap on link it get downloaded in your machine. 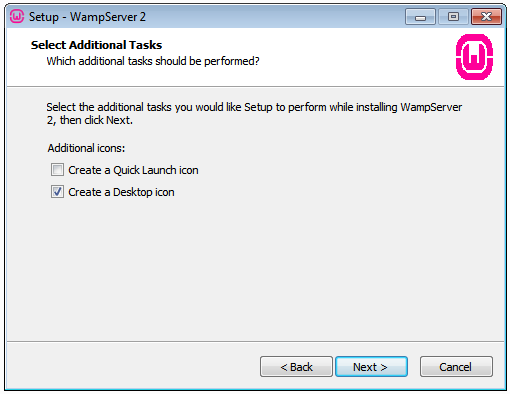 Now we have WAMP server so let’s start process to install WAMP server in local machine. In order to start please click on .exe file (we have just downloaded ) to begin installation process and move very similar to installation of any other software means next next next ..
WAMP is released under the GNU General Public License.so accept this this license and click on Next. By default system install software in c drive ..here you can make change as per your convenience. If you want to make desktop icon means short-cut then you can select checkbox like below. Now it’s ready to start, if you want to make any change then you can click on Back button. it extracting file to selected location. 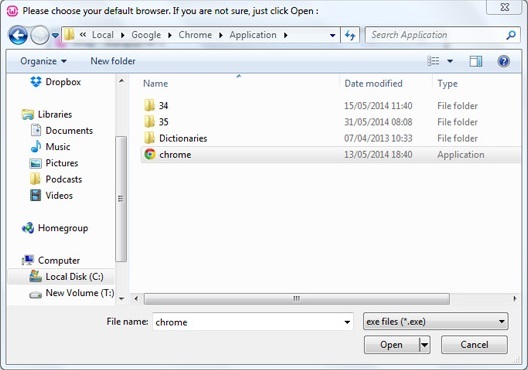 Now choose default browser for wamp server.Here I am choosing chrome browser as default. SMTP and email information required but as of now keep it same and click on next.You can set it later time..
Now at last click on Finish button to get launch WAMP server. Once you finish installation then you can see WAMP server icon in your bottom right side of taskbar like below (must be in green color). 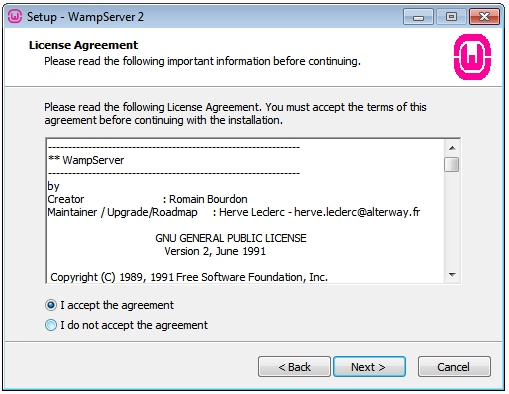 How to verify if WAMP installed successfully or not? In order to verify you just have to write localhost in any browser. Once you write and press enter then you will see as below image . Note:- Every time you turn on machine then you need to activate wamp server by double click on icon. 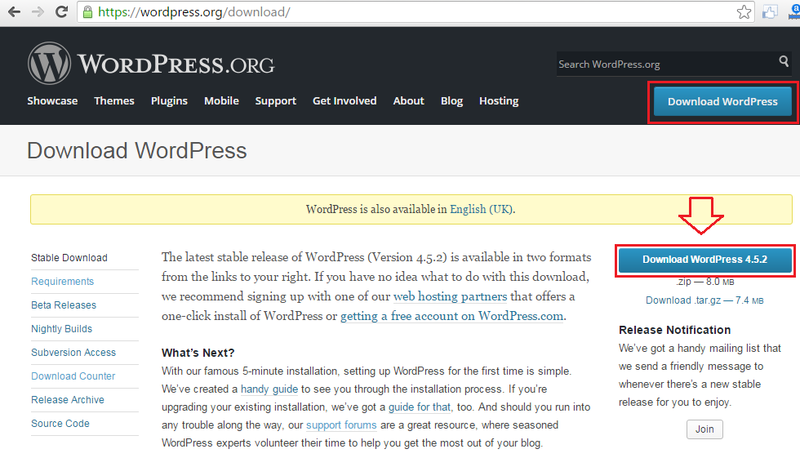 In this step we are going to install WordPress so firstly open wordpress website and click on download WordPress button to get latest version of WordPress, Now WordPress 4.5.2 (May 2016) is latest one so I am going to downloading the same. 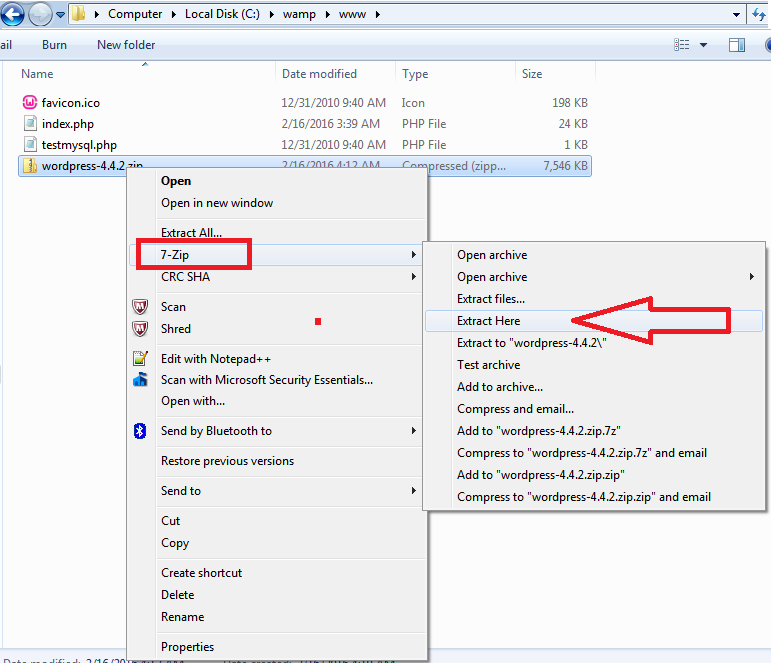 Once wordpress downloading complete then move zip file(wordpress) from download folder to C:\wamp\www folder and do right click on file and select extract here (by using winzip or 7zip software). Now change file name with your blog name so that would be more easy to remember. 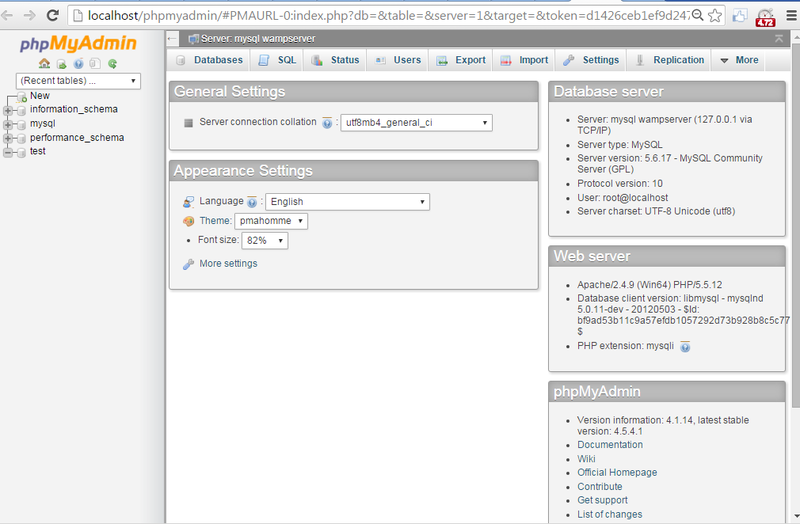 Now we are moving toward database configuration so to open database just browse localhost/phpmyadmin or open localhost as above and click on phpmyadmin like below. Now select database tab from top side as below and provide your database name (Any name related to your website) and click on Create button. It create new database with given name. 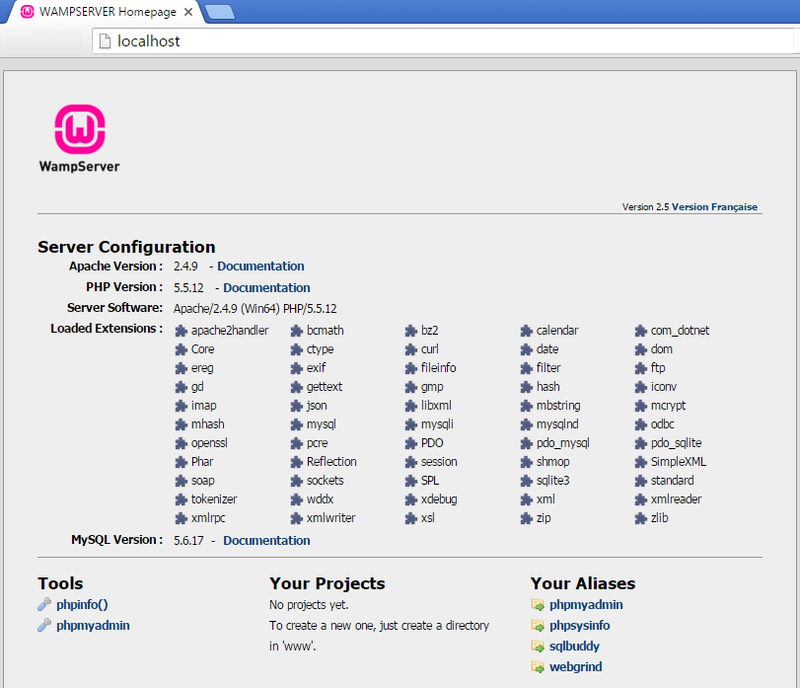 Now next step is to configure your wordpress. So just put your blog name (which you have rename in initial step) after localhost like localhost/wordpress-tutorial in address bar. Once you open it ask you to configure blog and start from language. Select English or your regional language from list and click continue. Next fill database details but remember few thing before clicking on submit button. Database Name: It should be same as you have given in previous step means your already created database name for my case it is ‘wordpresstutorial’. 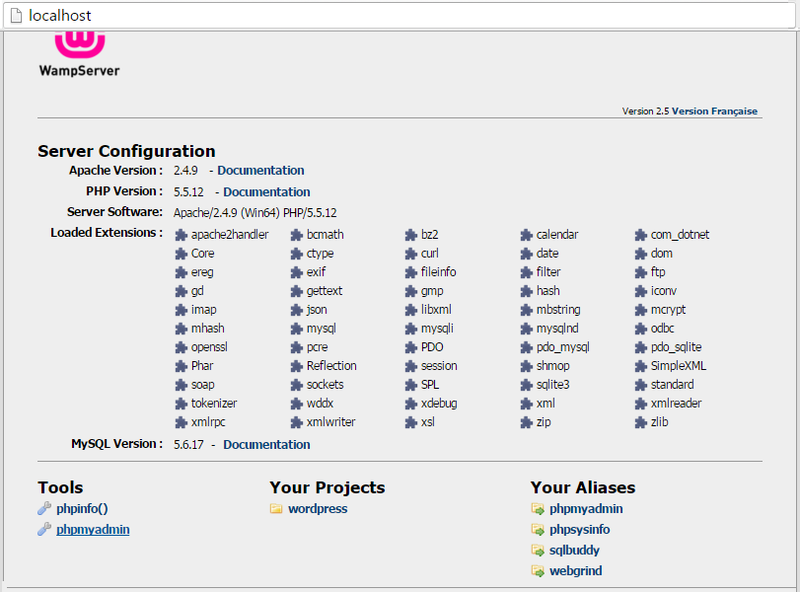 localhost /phpadmin in address bar then you can see under your project. Username: is ‘root’ by default as per MySQL username. Password: keep it blank. If you haven’t mention at the time of database creation . We are keeping blank as we did not provided any password. Keep other two field as it is and then click on submit. Recommendation:- Please make change table prefix from Wp_ to something complex so hacker can not guess easily and compromise your website. In next screen just click on Run the install and move ahead. 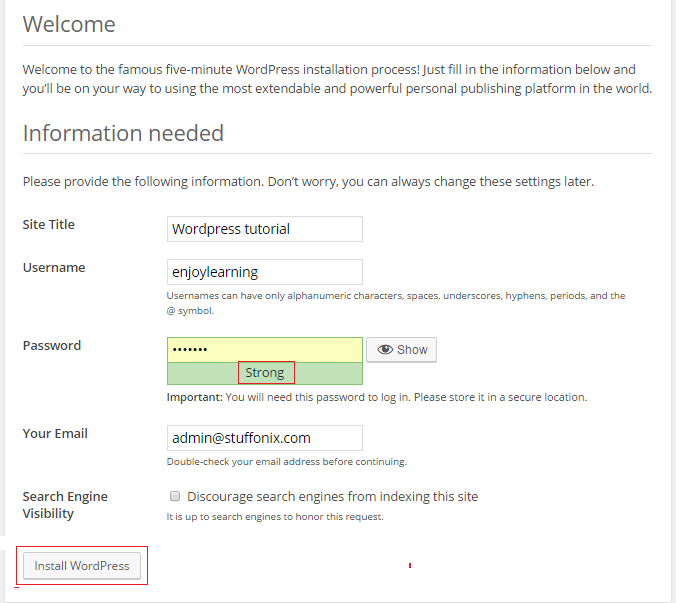 Here provide your title of blog , user name(Should be complex) , password (should be strong) and email address then click Install WordPress button . Note:- You can change Username and password later time also. Note:-Please do not select ‘search engine visibility’ checkbox Otherwise search engine like google will not index your website. Yup!! your wordpress installed successfully…you can now access admin panel by clicking on Log in button . Provide your wordpress credential to access your new blog. So guys I hope now you realize installation of wordpress is very easy task and any lay person can do by just following above steps. 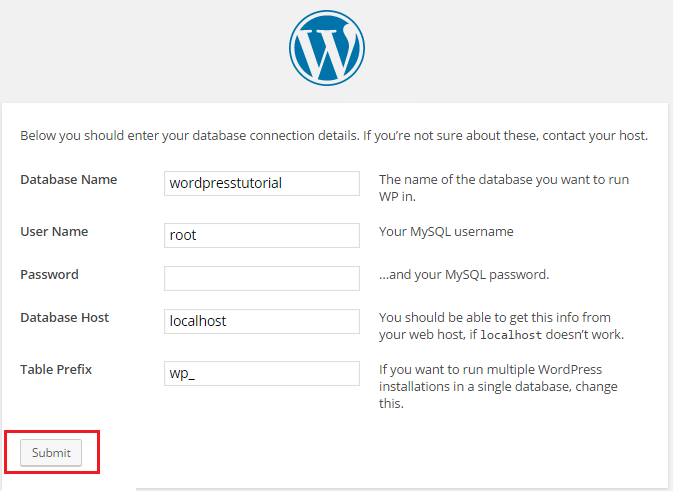 Hope you follow this step by step guide and successfully Install WordPress locally. Still if you face any issue then write us in contact box..